Removing the skin from fish is optional. You can certainly cook the fish skin on and serve it that way. You can also remove the skin after cooking, but it disturbs the delicate meat and doesn’t make a very nice presentation. 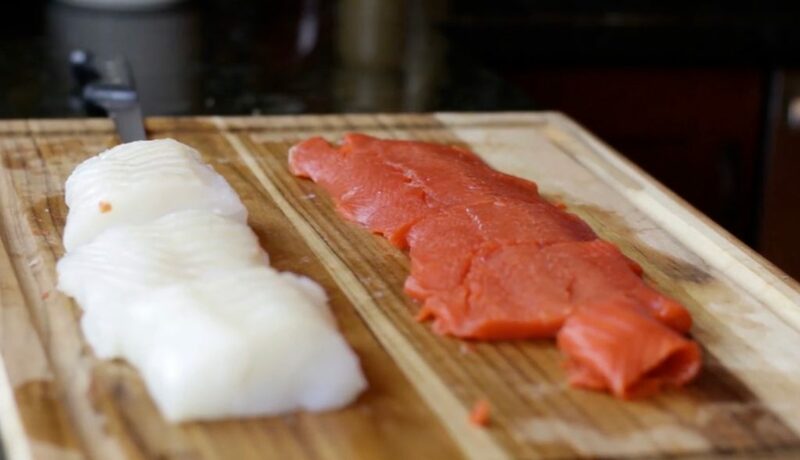 We demonstrate here how to skin fish fillets before cooking. Remember, too, that any fish monger will do this for you, you just have to ask. I also like to cut the fish into individual portions before cooking. It’s easier and much neater. It’s always a great teaching moment when things don’t go smoothly. My knife didn’t stay the course (the knife, not me) and a strip of skin stayed in place. A mistake when teaching is always a golden opportunity to show how to correct it. See how to fold the thin portion on a salmon fillet to cook evenly. We roasted these beautiful cod and salmon fish fillets and used these compound butters to create a quick and easy sauce. Check out our Fish Master Class on YouTube.